Have you been using Salesforce Field Service Lightning? Perhaps you configured the product to fit in with your field service processes and now administer it for your company? Well if you can relate to any of those I am pretty sure you will have had some product hiccups along your FSL journey. Like most implementations, pre and post production stages have their challenges. The first, getting to know the product and then adapting it to your business needs. During this stage it is very easy to miss features that might have a big impact on the way FSL works for you. This is especially true as most config can’t be applied to change sets; You really have to remember all config changes between your testing environment and live. The second challenge is going live. You have gone live with the product and your service resources are using the product. During this teething stage the chances of receiving FSL issues are relatively high. Having experienced a number of issues myself, I can happily say, like many things with Salesforce, there is pretty much always a solution. Here are a few bumps I experienced and solutions I found along my FSL journey. Hopefully they can help you on yours. Problem: When an appointments status is set to a custom value e.g ‘’Travelling’ – The resource is removed from the Service Appointment. Solution: When creating a new status value you will need to specify their ‘Category Status’. In this case more than likely the corresponding category will have been ‘None’. This will remove the resource and reset the service appointment. Simply changing the Category Status to ‘In Progress’, ‘Schedule’ etc will resolve the issue. Problem: This one seems to be a popular one amongst the FSL community. Your field rep is out on a job when they report that they are unable to generate a Service Report from a work order via the FSL app. This is a key example of the forgotten manual config between orgs. Solution: Make sure you have assigned a Service Report Template to all Work Type records. Problem: The calendar is scheduling appointments even if resources have absences scheduled. If like me you implemented an approval process back in the day that appeared to work correctly with FSL scheduling and then all of a sudden found out that it no longer worked. We can give thanks to a little Winter18 update called ‘Approval Confirmation’, for that. Solution: Firstly add the ‘Approved’ field to the Resource Absence page layout. Then navigate to FSL Settings >Scheduling>General Logic> and enable ‘Activate Approval confirmation on resource absences’. Enabling this option will remove all absences from the Gantt chart, this is to be intended. Once this is enabled, you will then need to retrospectively make this checkbox true on all future absence approval records. This will then resubmit the record into approval where by the manager will need to re-approve for the absence to 1) reappear on the Gantt chart and 2) to be taken into consideration when scheduling resources. Problem: You or some of your users may have reported an issue with the Data Integration Rule. Sometimes you may see the status ‘Not Compared’, this means that the address on the SA record hasn’t been compared with the available address records in the Data.com service. As a result this could affect scheduling as booking an appointment takes into consideration the address on the SA. And while the issue is normally short lived and doesn’t necessarily pose a great impact on Appointment booking, there are moments where this could be an issue. Solution: Not much of a solution I’m afraid. If you need to book an appointment as soon as the record is created, but see a status other than ‘In Sync’, wait a moment and click the update action. This does mean that you have to keep an eye on the Data Integration Rule Status. Problem: You arrive at work to find that some of your Service Appointments scheduled in the next 24 hours have been dispatched. This doesn’t fit in with your manual mass dispatching which happens the night before the appointment scheduled date. Solution: There is a little checkbox in the FSL settings called Auto Dispatch. 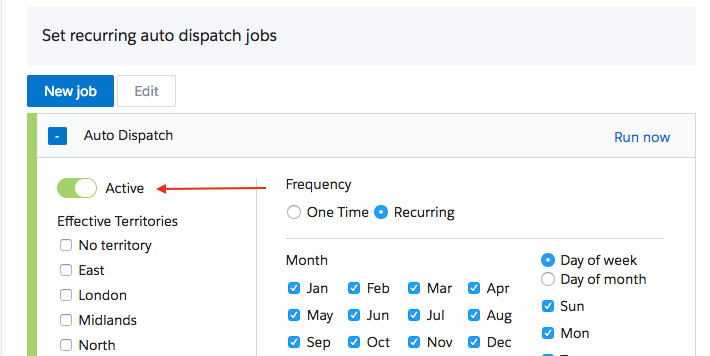 If want your dispatchers to have manual control on SA then deselect this option. If not, it’s a rather neat feature to have enabled! Problem: Do you have issues where the next Service appointments are automatically being dispatched when a previous / current appointment has been completed /cancelled? Solution: Again this is another one of those small checkbox features that can cause issue to your service appointments. Located in your FSL settings, search for Drip Feed and configure / disable this feature. Problem: If like me you were wondering if it is possible to delete skills – Unfortunately this is not possible, currently. If you have anymore issues, please leave a comment on this blog or take advantage of the community, they really are brilliant! I’d like to say a massive thanks to all those in the Salesforce Partner Community Group – Field Service Experts. You’ve made and continue to make the FSL journey that much smoother. Jenny – great post of FSL gotchas. We found with State / Country picklist enables, the work order address does not automatically write to the Service Appointment. As such, we had to roll our own Process Builder / Flow to get the WO address up to the SA. I am configuring FSL app but getting this error when choose to book appointment using Global action . I have configured the same in my test org and there it is working fine. It will be very helpful if you can provide some solution or explanation on why this is happening . we are facing the issue while opening the FSL app in iphone do anyone has faced similar issue? I have a doubt while learning about FSL, While creating a service report on a work order, it is showing that report to WO only rather than showing it on a work order line item or on service appointments? Why we have to create a service report separately for each object? Is it possible to create a service report on all of these objects with a single click? I want to create a service report through service appointment which will create the report on SA usually but I also want this report available for WO. So I will be very thankful if you can provide a solution for this or any explanation on how to perform or resolve this issue. I Want to create capacity based service resource with capacity hours in week for 1 year but it force me to put end date as 1 week apart from start date. For example : I want to create service resource whose contract with our company is from 1st Jan to 31st Dec and he can work 10 hours per week. So how I can define this in field service lightning.